We were sitting on the balcony of our hotel high above the Adriatic with a view directly into a large, empty, open air restaurant built in a cave which was also high above the crashing surf. For experienced independent travelers we were getting a little concerned. Did we just make a big leap of faith on a good friend’s recommendation to go to this isolated location for an exceptional dining experience? After a 3 ½ hour long, uneventful drive from Positano on the west coast of Italy to Polignano a Mare on the east coast of Italy we arrived at this ancient village located several miles below Bari. We rarely plan a one night visit as it is against the ‘mantra of slow travel” but this was a very special restaurant and hotel highly recommended by our friend who lives in Milan. With adventure in mind, we made the exception. We arrived in the middle of “riposo”, or “nap time”, so this small town was literally closed up for a quiet period. One of the telltale clues were the single chairs in front of the doorways. In this southern part of Italy the chair’s orientation sends the message of ‘do not disturb’ if their backs face the street and If their backs face the doorway, then a guest is welcomed….simple but effective. We had time to spend since our room was not available so we toured this very old fishing village and came across a World War II Memorial that had fresh flowers and an American flag! The town still remembers the American Troops that helped to liberate it back in the day. Polignano a Mare was settled in prehistoric times and is believed to be the site of the ancient Greek city of Neapolis of Apulia. 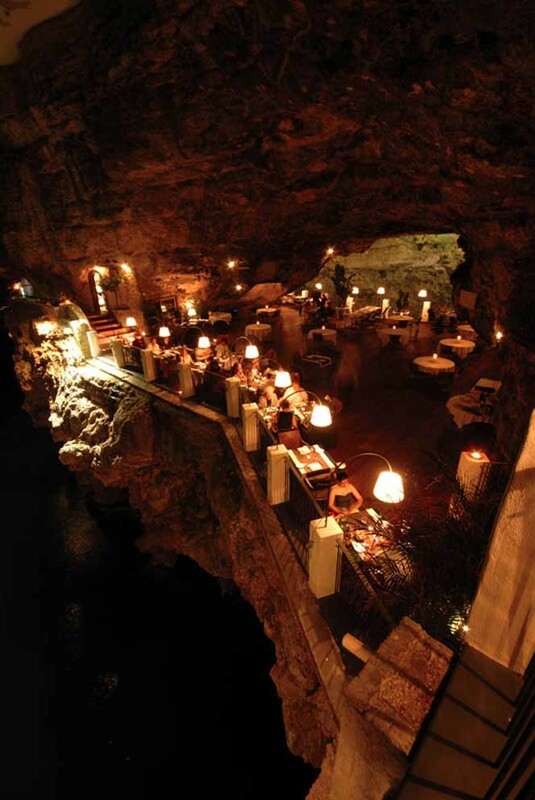 Today one of the main attraction is the Hotel Ristorante Grotta Palazzese which is considered one of the most romantic in the world. 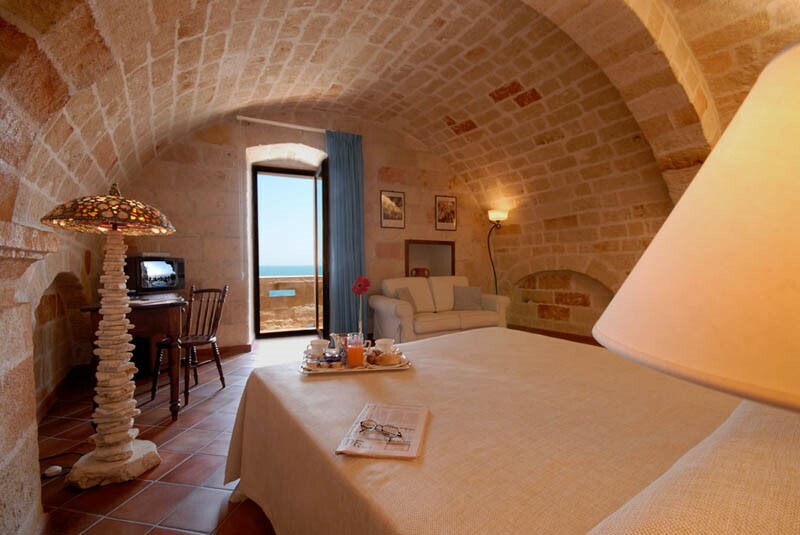 It has 25 rooms of quality and uniqueness with spacious, arched ceiling accommodations built into the solid limestone rock. The beautiful dining area has been hosting the local nobility since the 700’s and the fortunate visitors since. Our room would soon be ready so we parked the car and went in search of a wine merchant to buy a bottle of local wine to enjoy in our room before dinner…it is one of our traditions. That would not happen. Nothing was open. We returned to the hotel and explained to the hotel manager, in our best Italian, that we had been out looking for a nice bottle of wine and he was puzzled… “Why would anyone search for a bottle of wine outside the hotel if we have wine here that we would be happy to deliver?” Well, OK, that was logical and in a few minutes a bottle of sparkling wine, in an ice bucket, with two glasses arrived on a silver tray. So we sat on our stone balcony watching the waves crash 100 feet below on the side of the hotel, anticipating a fabulous dining experience. So, now it is close to our 9:00 pm reservation time. We are dressed and still looking towards a dark restaurant. This is silly… we are now really hungry and we know it would be all but impossible to find somewhere else to eat. We might have to dip into our road rations of Chez-its and Goldfish crackers! We poured another glass of wine and began to feel a little anxious and discussed a Plan B (Snack Food and Asti Spumante). To the refrains of…. “I’m sorry… I hope this doesn’t turn out to be a bust”. At that moment we suddenly see a dark figure walking amongst the empty tables. A candle is lit, then another, and then another! Soft lights appear as do more waiters in white gloves and tuxedos adjusting table linens and silverware. There is LIFE! Having been ready for over an hour, we bolt out the door, walk around the entire hotel, finding the obscure entrance, hurrying down a narrow flight of stairs to beat the crowd just off an Italian tour bus and finding that our reservation was intact. 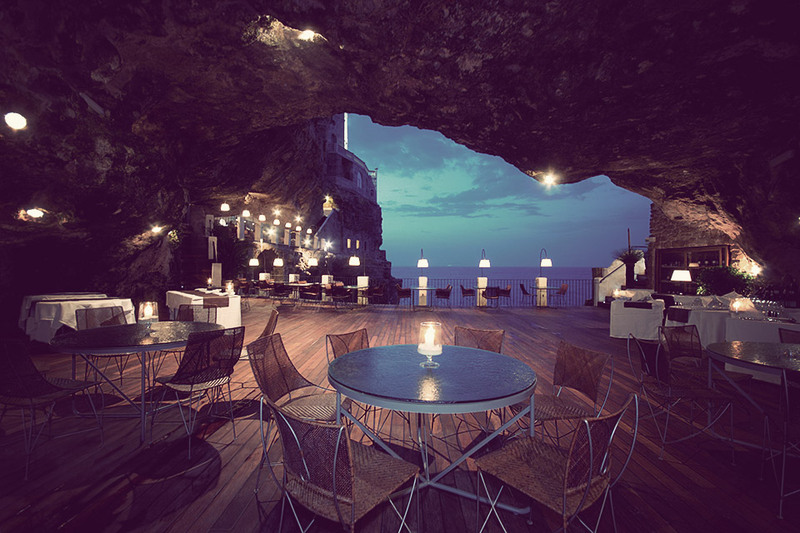 The restaurant is in a cave. The ceilings and walls are rock. You can feel the fresh, salty air wafting in. It was truly magical. We were led to a beautiful table on the side against a railing that was at least 100 ft above a surging ocean in the dramatically lit grotto. First we ordered a beautiful white Italian wine, Fiano de Avellino Fenli Disen Gregorio… and they started us with an appetizer of smoked, lightly breaded shrimp plus marinated cucumbers and radishes complimented it with a glass of Asti Spumonti. The waiter spoke a bit of English but wanted to speak very fast Italian. He was rushing us and, in my best performance, I said, “scusi, lentamente per favore!” (slow down, please!) and we were good for the rest of the meal. Don’t let the servers rush the meal. They truly believe that Americans want to eat and run. Not us. We want to savor every bite. And so we continue with Mare di Adriatico, (a seafood medley from the waters of the Adriatic), artichoke crab cakes, Sea Bass Carpaccio, Linguini a Mare, Ravioli a Mare, octopus in tomato sauce, each one better than the other. Every plate we ordered seemed to be delivered with a complimentary dish we did not order! And a never empty glass of the sparkling wine. When it was time for the main dish, a beautiful whole sea bass, skinned and filleted at the table, we could only taste a small portion. There was simply no more room in our stomachs. Then they brought biscotti and lemon sorbet. Basta Finito… Enough, we are FINISHED! A true dining experience in true Southern Italian style… the restaurant was still seating at midnight! The next morning upon checking out we found that the meal was included in the price of the room… the wine was extra so our meal came to about $40. We rank this exceptional meal as one of our TOP TEN dining experiences and It was certainly worth the drive across Italy… now we are off to Rome! This entry was posted in Uncategorized on May 15, 2015 by Bob and Janice Kollar. What a great dining experience. Thank you for sharing.